This article was published in no small part with the help of studies from Joel Richardson, author of Mount Sinai in Arabia. The theory that Mount Sinai is located in modern-day Saudi Arabia is treated as a fairly new idea, but our research shows that there is a long tradition in support of this theory. Evidence for this alternative theory is substantiated by historical references and maps which are is older than any other tradition about the location of Mount Sinai. The traditional location for Mount Sinai is at St. Catherine’s Monastery in Egypt’s Sinai Peninsula. However, many researchers have been disappointed with the lack of evidence at the site, resulting in dismissals of the credibility of the Exodus story or proposals for other Mount Sinai candidates. St. Catherine’s/Jebel Musa (read more here) was established as a possible site by Helena during her journey from the years A.D. 331-334. However, there are Jewish traditions that date about 600 years before then which point to Jabal Maqla/Jabal al-Lawz in Saudi Arabia as the true Mount Sinai. Traditions from Christian, Jewish, and Islamic sources, as well as cartographers, explorers and historians, state or infer that Mount Sinai is located in northwestern Saudi Arabia. These non-Biblical sources describe the mountain as “the highest peak in the region” of Midian, an ancient land located in northwestern Saudi Arabia. A review of these accounts shows that, even after the traditional location was marked by Helena, a competing tradition placing Mount Sinai in Arabia persisted. The following sources are organized in chronological order and by religion. The oldest recorded transition pointing to Mount Sinai as being in Saudi Arabia dates back to the 3rd century B.C., about 600 years before the St. Catherine's tradition was established. The Septuagint (the first known translation of the Original Hebrew Pentateuch and following books, known as the Old Testament in the Christian Bible) was translated and circulated among the Alexandrian Jewish population. Dr. Allen Kerkeslager concluded in a scholarly study that the Septuagint is among the oldest works to state that Mount Sinai is in northwestern Saudi Arabia. The Septuagint's version of Exodus says that Mount Sinai is near an ancient city named Madyan, also spelled as “Madian” and “Madiam.” It states that Madyan is the land of Jethro where Moses fled to after killing an Egyptian. Madyan corresponds to a city named al-Bad in Saudi Arabia today and the name still shows up on current maps. Current Bibles state that Moses went to “Midian,” a broader ancient land that would include Al-Bad (read more about Midian & Moses here). The Septuagint refers to the specific city of Madyan that would be within the broader territory of Midian. It has also been suggested that Madyan would be referenced in the 3rd century B.C. as a way of referring to Midian overall or that Madyan/Madian/Madiam are alternative spellings of Midian. Dr. Kerkeslager’s study found that these sources report that Mount Sinai/Horeb is near this city, pointing to Jabal al-Lawz/Jabal Maqla, which are both a short distance from al-Bad. Philo was a Jewish philosopher who was alive in the time of Jesus and lived in Alexandria, Egypt. Philo placed Mt. Sinai east of what is now Egypt’s Sinai Peninsula, and south of Palestine. He used the Septuagint as his exclusive source. In On the Life of Moses, Part II, he described Mount Sinai as "the loftiest and most sacred mountain in that district in accordance with the divine commands, a mountain which was very difficult of access and very hard to ascend..."
"In addition to his use of the terms "Arab" and "Arabia," Philo gives us an even more direct indication of where he believed Mt. Sinai was. He describes the Israelites wandering eastward all the way across the Sinai peninsula to the southern edge of Palestine just before the revelation at Sinai. Philo thus places Mt. Sinai somewhere east of the Sinai peninsula and south of Palestine—in other words, in northwestern Arabia. Philo adds one more detail to our collection of traditions about Mt. Sinai; he says that Moses "went up the highest and most sacred of the mountains in its region." "For, having gone up into the highest and most sacred mountain in that district in accordance with the divine commands, a mountain which was very difficult of access and very hard to ascend, he is said to have remained there all that time without eating any of that food even which is necessary for life; and, as I said before, he descended again forty days afterwards, being much more beautiful in his face than when he went up, so that those who saw him wondered and were amazed, and could no longer endure to look upon him with their eyes, inasmuch as his countenance shone like the light of the sun." This is only the reference to the height of what Philo calls Mt. Sinai. Philo’s commentary also includes other corroborating descriptions of the Saudi Arabia location for Mount Sinai, such as the path walked by Moses. This piece of evidence is further strengthened by how the Septuagint translators wrote that Jethro “went out” or “into the desert” from Midian in Exodus 18:5. They also seized on the passages by which they imagined the Hebrews might fly, shutting them up between inaccessible precipices and the sea; for there was [on each side] a [ridge of] mountains that terminated at the sea, which were impassable by reason of their roughness, and obstructed their flight; wherefore they there pressed upon the Hebrews with their army, where [the ridges of] the mountains were closed with the sea; which army they placed at the chops of the mountains, that so they might deprive them of any passage into the plain. Josephus’ Antiquities is one of the most important historical sources for this project and is cited on many of our various chapter pages. There is admittedly very little in terms of records regarding Mount Sinai's true location in Jewish history. It seems that the Jewish people did not have a strong interest in maintaining knowledge of the mountain's location. Rather, interest in this topic seems to be a more distinctly Christian phenomenon. Pilgrimage to Mt. Sinai does not seem to have been an important means of affirming Jewish identity. Jews had many other ways of affirming a concrete physical connection to Jewish history, including the contemplation of their own biological existence. Later Gentile Christians may have felt more compelled tomake pilgrimages to Mt. Sinai and other concrete sites associated with Israelite history because, unlike Jews, they could not point to their own physical descent to support their claim to being “the true Israel.” Pilgrimage to sites from Jewish history was more of an identity imperative for Christians than it was for Jews. Allen Kerkeslager, “Jewish Pilgrimage and Jewish Identity in Hellenistic and Early Roman Egypt,” in Pilgrimage and Holy Space in Late Antique Egypt, ed. David Frankfurter (Leiden: Koninklijke Brill, 1998), 207. Paul, who described himself as a chief Jew among Jews, and author of two-thirds of the New Testament, refers to “Sinai in Arabia” in Galatians 4:25. The book is believed to have been written approximately 49 A.D. There is a debate about whether the Arabia he refers to (Arabian Petra) would include the southern part of Egypt’s Sinai Peninsula, and therefore potentially refer to the traditional Mount Sinai location. At the time Paul wrote this, Arabia was a region on the outskirts of the Roman Empire. According to Glen Bowersock, scholar of Ancient Rome and the Near East, Arabia in the days of the Roman Empire encompassed an area southeast of Palestine. Although the heartland of the Arab nations was what is known today as Saudi Arabia, the Romans gave the name Arabia to a province of their empire which lay south and east of Palestine, in the corner of the Mediterranean world between Syria and Egypt. It comprehended the Negev, southern Syria, all of Jordan, and northwest Saudi Arabia. When Paul referred to Arabia in the book of Galatians, it would have been within this context and framework of understanding. In Galatians 1:17, Paul also stated that he traveled to Arabia after his conversion on the road to Damascus. I did not go up to Jerusalem to see those who were apostles before I was, but I went into Arabia. Later I returned to Damascus. New Testament scholar N.T. Wright theorizes that Paul may have gone to Mount Sinai just as did the Old Testament prophet Elijah. In an article titled Paul, Arabia, and Elijah, Wright states that Paul may have gone to Mount Sinai as a part of his conversion, to deepen his relationship with God. “[It] Lies beyond Arabia to the south in the desert of the Saracens, east of the Red Sea. From this they are called Madianites, and it is now called Madiam." Dr. Allen Kerkeslager states in his essay on Jewish Pilgrimage and Jewish Identity (see more below) that in Eusebius' day, Arabia was a province of the Roman Empire, but that by the time he wrote his account, the border of the Roman province of Arabia was moved northward so that Madiam was beyond the border at that time. By the time of Eusebius, the major centeters of the Roman province of Arabia had moved northward. The southern border of the province was consequently deliberately relocated northward by detaching the southern region of the province of Palestine. By the fourth century, Eusebius could easily look out from his window in Caesarea and say that the city of Madyan in northwestern Arabia was "beyond Arabia toward the south." Allen Kerkeslager, “Jewish Pilgrimage and Jewish Identity in Hellenistic and Early Roman Egypt,” in Pilgrimage and Holy Space in Late Antique Egypt, ed. David Frankfurter (Leiden: Koninklijke Brill, 1998), 198. In Dr. Kerkeslager's assessment, the fact that Eusebius placed Sinai/Horeb in close proximity to the city of ancient Midian strongly suggests it was nearer to this city than anywhere in the Sinai Peninsula. Jerome was a Latin Philosopher who took part in translating Eusebius’s “The Onomasticon" into Latin. Jerome also placed Madyan in northwestern Arabia east of the Red Sea. Eusebius had identified Horeb and Sinai as two separate mountains, but Jermoe saw them as one. How Long Did This Tradition Last? By Jerome's time, the "new" theory of Mount Sinai's location began to develop and proliferate. According to Dr. Allen Kerkeslager, the monastic communities in the Sinai Peninsula took their claim to fame to the world and gradually eclipsed the previously accepted Arabian location. However, the Arabian adherents seemed to continue for several centuries, according to his research. [T]he tradition of locating Mt. Sinai near the city of Madyan apparently persisted in Christian circles until sometime after the Arab conquest. Islamic sources from ca. 700 refer to Christian anchorites who lived in the mountains around Madyan. These anchorites, possibly together with local Jews, may have been the source from which later Islamic tradition received the traditions associating Moses and Mt. Sinai with the city of Madyan. Allen Kerkeslager, “Jewish Pilgrimage and Jewish Identity in Hellenistic and Early Roman Egypt,” in Pilgrimage and Holy Space in Late Antique Egypt, ed. David Frankfurter (Boston: Brill, 1998), 199. Kerkeslager further states that the modern town of Al-Bad, which is ancient Midian, is home to an unbroken tradition identifying Jabal Maqla as Mount Sinai that dates back to 250 B.C. with the first mention in the Septuagint. The Islamic holy book refers several times to Moses' father-in-law. "Shu'ayb," a prophet of the pre-Mosaic period, and later identified as Jethro, is mentioned several times in the Quran, and the author clearly locates him in the ancient city of Madyan. Tafsir Ibn Kathir on Quran 7:85 This translation has been modified by this author in order to make it more readable to a popular western audience. Al-Ya’qubi, 1988, 341 as quoted in Dr. Abdul Rahman al-Tayyib al-Ansary, Al-Bid’ History and Archeology (Kingdom of Saudi Arabia, Ministry of Education, 2002), 17. ...at the cost of the Qulzum Sea, lies the city of Midian, which is larger than Tabuk. Inside the twon was the well from which Moses (Peace be upon him) extracted water for the livestock of Shu'aib [Jethro]. But the well is said to be dried up and a house was built in its place, while the inhabitants dependedon drinking water from a nearby spring. Midian was named after the tribe of Su'aib. It was a hard place to live, even the trade there was inactive. Al-Idrisi quoted in Dr. Abdul Rahman al-Tayyib al-Ansary, Al-Bid’ History andArcheology (Kingdom of Saudi Arabia, Ministry of Education, 2002), 17-18. French cartographer Chez Pierre Mariette drew a map of the Arabian Peninsula in 1654, and identified locations for Madian, Sinai Mont, and Mont Oreb. Though the map omits the Gulf of Aqaba, he placed Sinai/Oreb to the east of Madian. Dutch cartographer Frederick de Wit also drew a map of the Arabian Peninsula nearly three decades after Mariette. He identified Madian, “Horeb M.”, and “Sinai M.” on his map. Just as with Mariette, the map did not show the Gulf of Aqaba, but de Wit did place both Horeb and Sinai considerably to the east of Madian, roughly corresponding with the Jabal al-Lawz/Jabal Maqla mountain range. Willam Whitson of England was a theologian, historian, and mathematician. In 1737, he translated Josephus' Antiquities of the Jews into English. In Book III, in the section describing how Moses struck the rock at Rephidim and water poured forth, Whitson wrote in a footnote that this particular rock was visible to travelers and intimated that he knew its location. The only rock that fits this unique description is the one that sits upon a hill northwest of Jabal Maqla in Saudi Arabia. In the mid-1800s, Charles Tilstone Beke, an English geographer, traveler, and Biblical critic, traveled to the Sinai Peninsula in what is now the nation-state of Egypt. He looked for evidence of Mount Sinai and the Exodus in the Sinai Peninsula but did not find anything convincing. When relating how Moses fled from Pharaoh, king of Egypt, he [Josephus] says that "he came to the city Midian, which lay upon the Red Sea, and was so denominated from one of Abraham's sons by Keturah." Now we are told in Scripture, that those descendants of the Patriarch were sent into the "east country," that is to say, into the regions lying to the east of the valley of the Jordan and its continuance south- ward to the Gulf of Akaba, and not anywhere within the peninsula west of that gulf, where Moses's place of refuge has been so erroneously imagined to have been situated. Beke concluded that the likeliest location for Mount Sinai would be northwestern Arabia. He later traveled to northwestern Arabia and found volcanic fields that believed could have been the reported manifestation of fire and smoke on Mount Sinai. Based on his research, he said that Sinai was likely Mt. Baggir, and Horeb was Mt. Ertowa. There is no evidence to suggest that Beke was aware of, or examined, Jabal al-Lawz/Jabal Maqla as part of his survey. Richard Francis Burton was an English geographer, cartographer, and writer. He traveled to Arabia in search of gold and the source of Arabian wealth. According to his records and research, the Egyptian Sinai Peninsula belonged to the ancient Egyptians as early as the Sixth Dynasty (2323-2510 BC). Midian and Egypt would not have shared this territory and, around the time of the Exodus, Dr. Charles Whittaker found that the Peninsula was a protectorate of the ancient Egyptian empire. This would make it impossible for Mount Sinai to be in Egypt’s Sinai Peninsula, as the traditional site and some other candidates are. According to Burton’s research, he didn’t specify Jabal al-Lawz or Jabal Maqla as Mount Sinai, but he did appear to favor an Arabian location. In his works, he quotes Eusebius saying that he assigned Rephidim and Horeb to “Pharan,” and the Mountain of God to Midian. Musil departed from Josephus’ claim that Sinai was the highest peak in the region, as Lawz is higher than Maqla. However, he did maintain a Midianite location for Sinai/Horeb. In 1926, Musil drew up a map of "Ancient Madian." Next to the city of "al-Bed," one can see an oasis of palm trees drawn to the east. Based on the information currently available to us, this could very well be Elim. Harry St. John Philby (Hajj Abdullah) traveled to Arabia and extensively exploreed the region. He used Musil’s maps and published The Land of Midian in 1957. Philby does appear convinced that this was Midian though, the home of Jethro, giving it a connection to Moses. He said that Musil’s claim for Hurab didn’t yield him any evidence, such as inscriptions. From here [the ridge which had the ‘Circles of Jethro’] I had a magnificent view of the whole of the Midian mountain range, with Lauz [Lawz] and its sister peaks in the northeast and Maqla’a very little north of east, with the valley of al-Numair separating the latter from the low ridge of All Marra, extending from east to south-east, where the two peaks of Hurab stood out in front of the great range of Zuhd, which runs down to a point not far from the sea to our southward …. The spot that held my imagination was the smooth, double-headed, granite boss of Hurab, an obvious candidate for identification with the Mount Horeb of the Exodus…the only candidate for the honor which can claim to have preserved the name…According to Hasballah, the name Hurab applies primarily to the wadi [canyon], while he calls the mountain itself Al Manifa (which simply means lofty). Amateur explorer and controversial figure Ron Wyatt claimed to have found evidence of the Exodus in northwestern Saudi Arabia. Wyatt and his two sons were arrested by Saudi police after illegally entering the country from Jordan. They were held for 70 days before being released, but their photographs were confiscated and the evidence was lost. Years after Wyatt’s captivity, pictures started leaking to the outside world showing strange things at Jabal Maqla and the surrounding area. Former police officer Bob Cornuke and Wall Street trader Larry Williams visited the mountain in 1988 and were likewise detained and had their evidence confiscated. Cornuke recounted the journey in his 2000 book In Search of the Mountain of God: The Discovery of the Real Mt. Sinai. Video and photography of the mountain and associated evidence began anonymously leaking out in the 1990s. The source of the unprecedented photos and videos is now known to be Jim and Penny Caldwell, an American couple that worked in Saudi Arabia from 1990 to 1998 and repeatedly visited the area in question. [T]he consensus is that ancient Midian was south of Eilat on the Saudi side… The notion that the ‘mountain of God’ called Sinai and Horeb was located in what we now call the Sinai Peninsula has no older tradition supporting it than Byzantine times. Cross would not guess which mountain is Mount Sinai, but held out Jabal al-Lawz as a distinct possibility. He said that the Saudis would not permit him and a colleague to excavate in the area for the American Schools of Oriental Research and British School of Archaeology. Dr. Kerkeslager wrote a scholarly article titled "Jewish Pilgrimage and Jewish Identity in Hellenistic and Early Roman Egypt," in Pilgrimage and Holy Space in Late Antique Egypt, which was edited by David Frankfurter. He affirms the Arabian location for Mount Sinai based on an in-depth study of Eusebius' writings. Because Eusebius located Mt. Horeb and Mt. Sinai next to one another, he must have believed that both were in northwestern Arabia near the city of Madyan. Dr. Kerkeslager noted in the article that many Western scholars have been hesitant to adopt the view that Mount Sinai is in Saudi Arabia, and that seems to be more because of the "inertia of one stream of scholarly tradition." This is in spite of the fact that Biblical and post-Biblical evidence suggests an Arabian location for Mount Sinai, east of the Red Sea, and not in the Peninsula. Based on his research, he concludes that it is "inexcusable" to ignore the evidence of the Exodus in northwestern Saudi Arabia, and at least as much attention ought to be devoted to it as has been devoted to St. Catherine's mountain, in spite of the rather scant evidence at the traditional site. If one seeks the "Mt. Sinai of Jewish tradition," one will henceforth have to seek a mountain near Al-Bad'. Dr. Kerkelsager was one of the first Western academics to seriously undertake scholarly research on this subject. In 2002, Dr. Lennart Möller published his tome, The Exodus Case, an extremely detailed science-based investigation into the theory. Moller is a professor of medical sciences in Sweden with a special interest in archaeology, Egyptian history, and marine biology. 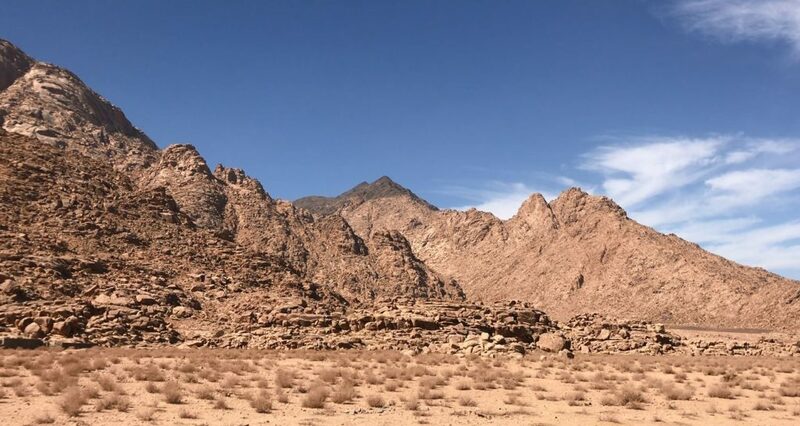 After gaining rare access to the mountain and the sites that may relate to the Exodus account, Möller endorsed Jabal al-Lawz and Jabal Maqla as the likeliest candidates for Mount Sinai/Horeb. Möller also concluded that the likeliest crossing point for Moses and the Israelites was from Egypt’s Nuweiba Beach into northwestern Saudi Arabia via an underwater land path in the Gulf of Aqaba. He also took part in diving expeditions to explore this land path and believes there is evidence of the destroyed Egyptian army in the coral. Several archaeologists from the Saudi Ministry of Museums and Antiquities published a detailed book about the history of the city of Al-Bid (also known as Al-Bad). In the book, the researchers found a great deal of evidence pertaining to the Exodus in the area surrounding this city, which was once Midian. Certainly, some inportant events occurred in the western coastal area of the Gulf of Aqaba which are related to Prophet MOses and his exodus with the Israelites from the lakes eastern Egypt, where he crossed by a miracle to the land lf Sinai, the land of (manna) and (quails), and the twelve wells which were gushed out by Giod in the desert of Sinai one springwell for each tribe. Dr. Abdul Rahman al-Tayyib al-Ansari, et. al., Al-Bid' (History and Archaeology), (Saudi Arabia: Ministry of Education, Deputy Ministry of Antiquities and Museums), 2002, 10. In 2003, Charles Whittaker published his doctoral thesis, "The Biblical Significance of Jabal al Lawz," for his Ph.D. from Louisiana Baptist University. His 225-page investigation considered over 20 candidates for Mount Sinai and thoroughly reviewed historical accounts, scholarly opinions throughout time, archaeological surveys, old maps, and satellite imagery. Whittaker concluded that Jabal al-Lawz “is the best candidate for the Biblical Mt. Sinai.” His doctoral thesis greatly assisted the Doubting Thomas Research Foundation in documenting this theory. In 2016, Dr. Miles Jones, a historical linguist with expertise in Thamudic inscriptions and the history of the alphabet, published, The Writing of God: Secret of the Real Mount Sinai. He has not visited the sites in-person but has analyzed pictures of inscriptions found in the area. Jones determined that the inscriptions are Thamudic and proto-Hebrew. He interprets them as referring to the Exodus events. He believes these inscriptions show the birth of literacy happening in the area, with letters replacing pictographs. Rabbi Hool published his book on the alternative location theory for Mount Sinai in 2017. The book, Searching for Sinai: The Location of Revelation, explores Jewish sources that offer clues for the location of Mount Sinai. He does not believe that Jabal Maqla is Mount Sinai, but does locate the mountain in Saudi Arabia, the ancient land of Midian. The Doubting Thomas Research Foundation traveled to Saudi Arabia multiple times over a period of two years to see the alleged evidence and document it thoroughly. This website, along with Sinai in Arabia, is the result of those trips and thousands of hours of editing, writing, researching, and interviewing. The Foundation believes that the tradition identifying Mount Sinai in modern-day Saudi Arabia has the most Biblical and extra-Biblical support. From roughly 250 B.C., when the Septuagint translation was produced, right to this very day, there has been a tradition that supports the theory of Mount Sinai being located in Saudi Arabia. Among the three major monotheistic traditions—Jewish, Christian, and Muslim—all three point us to the same place, the tallest mountains in the range just outside of the city of al-Bad, known today as Jabal Maqla/Jabal al-Lawz. Origen of Alexandria, Selecta Genesim (Select Comments on Genesis) PG 12.120, as referenced in Allen Kerkeslager, “Jewish Pilgrimage and Jewish Holy Space,” in Pilgrimage and Holy Space in late Antique Egypt, ed. David Frankfurter (Leiden, Netherlands: Brill, 1998), paperback edition 2015, 196. Charles Whittaker, “The Biblical Significance of Jabal Al-Lawz” (diss., Louisiana Baptist University, 2003), 72. Alois Musil. The Northern Hegaz. (New York: American Geographical Society. 1926), 269. John Philby, The Land of Midian. (London: Ernest Benn Limited, 1957), 210, 215. In 1978 Ron Wyatt and his two sons dove in the Gulf of Aqaba off the shore of Nuweiba Beach observing coral encrusted chariot parts and indicated his interest in Jebel El Lawz being Mount Sinai as written about in Rene Noorbergen’s 1982 book “Treasures of the Lost Races.” In 1984 The Wyatt’s were actually arrested and held for 78 days for investigating Jebel El Lawz. After convincing the Saudis of their true intent and showing them evidence they were released. The Wyatts returned home and gave witness to their discoveries in an interview with Bill Kurtis on CBS Morning News, April 17, 1984. Ron was invited back to the site in 1985 and so convinced the Saudis of the authenticity of the evidence for the Hebrews encampments around the mount that they immediately fenced off the entire area as an archaeological reserve.